Johan Clarey of France finished third, and overall World Cup leader Aksel Lund Svindal was fourth. Miller was fifth, 0.39 behind. VAL GARDENA, Italy — Canada’s Erik Guay won the World Cup downhill on Saturday, while Bode Miller was fifth in his best finish in a speed event this season. A year after missing out on the victory because of changing weather, Guay finished in 1 minute, 56.65 seconds down the Saslong course. He made up time over the last few gates to edge Kjetil Jansrud of Norway by 0.12 seconds. Miller took last season off to recover from left knee surgery and is improving race by race as he prepares for the Sochi Olympics in February. He made up more than half a second on the technical lower section. Last year, Guay had the lead before changing weather required a shortened course for late starters. Steven Nyman of the United States won, followed by Rok Perko of Slovenia and Guay wound up third. On Saturday, the weather wasn’t as severe, when wind played a role. But changing light once again made a big impact. Guay, Svindal and Miller had to deal with less light on the gliding section on top, but all three racers excelled on the more technical section of the course. Miller would have made the podium if he was just a bit faster on the flats. He said getting equipment dialed in after so much time off was a big factor. Nyman was an early starter and made a big mistake midway down and had to make an acrobatic recovery to avoid injury. But his race ended there. Brice Roger and David Poisson of France also fell. The course features camel bumps, which launch skiers into the air for nearly 90 yards, and the twisty and technical section of two areas one after another midway down. There are also numerous little bumps and jumps, making for constant air time. Guay’s performance was all the more impressive considering that he had left-knee surgery in the offseason and missed most of preseason training. “I had a great run last year,” Guay said. “In my mind I skied the best that I could have with my start number and not to take anything away from Nyman and Perko, but the conditions do change and that’s the reality of our sport. 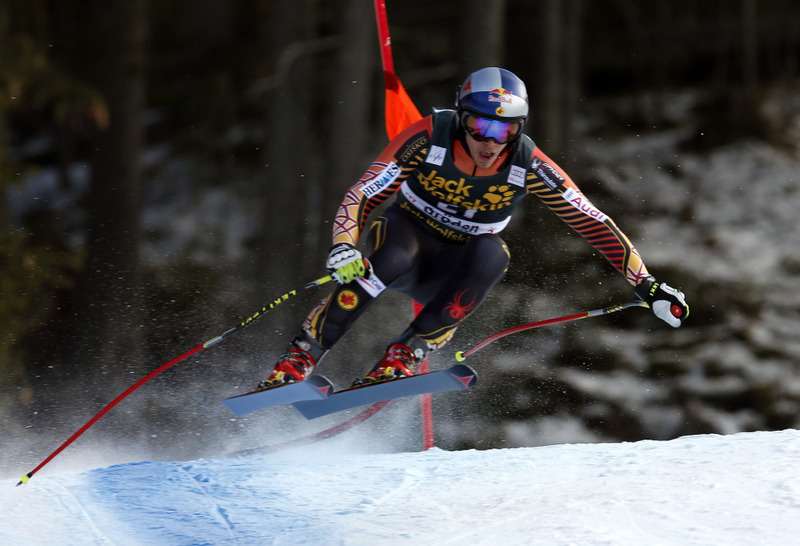 In the overall standings, Svindal moved 175 points ahead of Marcel Hirscher, who does not race downhill. Svindal also leads the downhill standings, 53 points ahead of Guay. The circuit moves over the Gardena pass for a giant slalom Sunday in Alta Badia, where Ted Ligety will attempt to duplicate his dominant win from last season.